2) Make Your Own Explainer Video – It’s Not That Tough As You Think! 5) Software Development: What is a Hook? Let’s Know About Few Types of Hook. 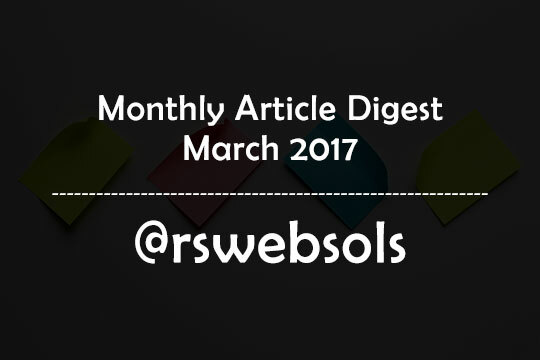 This is an article containing the monthly article digest of the month “February 2017” at RS Web Solutions (@rswebsols). You can easily find all our published articles of February 2017 in a ascending order by date. This is a monthly archive page to help our readers to give an easy-to-find list of monthly articles. Along with the article title, you can also able to read a short excerpt of each article. If you find an interesting article that catches your attention, you can, of course, click on the “continue reading” link to read the entire article. Happy reading! 14) 5 Common iPhone Problems and How to Fix Them? 18) Need Complete Newsletter Solutions within WordPress? Try These 5 Plugins. 19) 5 Internet Scams People Generally Fall For – Make Sure You are Not the One! 23) How Much Internet Speed Do You Need in 2017? Let’s Find Out! 30) Your Micro-Interactions Maybe Stealing Your Customer’s Attention – Find out how! 33) Is Search Engine Optimization (SEO) Effective for Selling Real Estate? 36) How Beneficial Strategies of Mobile App Marketing are Helpful for Your Business?